About a month ago, I drove past that ugly modern office building on the corner of Main and University, and struggled to remember what was there before. Then, I found this postcard, and memories rushed back in. 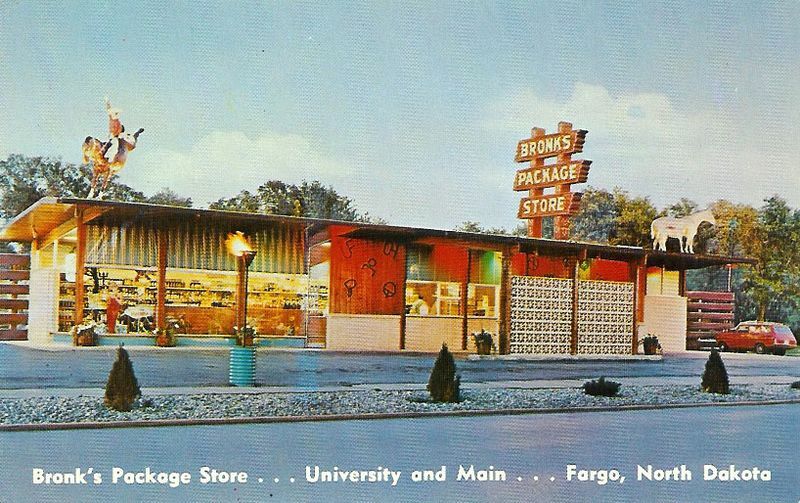 No, I don't think I was ever in Bronk's (we were a Polar Package Place family; it was closer to our home), but its central location in Fargo and garish exterior would make it hard to forget. I'm going to look through my archives and see if I can dig up any more on Bronk's, but I don't remember seeing anything about it recently. Today, garish exteriors are reserved for children's restaurants and theme buffets -- the interior of a liquor store isn't inherently anything, let alone to be 'themed' to attract customers. Modern stores aim for neutral efficiency, and 'vice' stores want to project professionalism lest they be called uncouth...but back in the day, when someone said to stop at the liquor store with the cowboy on top, you darn well knew where to go. Bronk's disappeared in the late 80s by my recollection, and was replaced by a law office building. No cowboys on the top of the law offices, sadly. Camera for the Year 2000, 1968. Adspace is provided via BlogAds, so go there to purchase advertising space at the top of every page on this site. Or, if you'd like something special, email Azrael Brown.